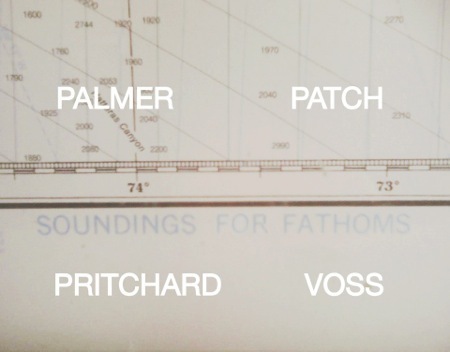 Originally a nautical term for surveying and charting depths of water, “Soundings for Fathoms” were traditionally done by hand with either a pole or weighted rope. Since the invention of SONAR, ‘sounding’ now refers to an electronic pulse or vibration that is emitted from the water’s surface to echo-locate the delineating edges of a target. An edge is created when a form or a boundary comes to be defined, whether by random accident or by willful intention. Clinical, mechanical, subliminal, incidental, haphazard – in visual art-making, the hand that renders edge-work reveals the temperament and attitude of the maker. The four artists represented have their own customized stockpiles of visual imagery, and an inventiveness for material resourcefulness that is both continually developing and deeply personal. What is shared among them is a primary identification with being a painter, but with an open, ecumenical perspective towards mediums, as well as an intuitive and improvisatory approach toward composition and process. This combination of factors unites them in a sensibility that makes it hard to determine which cause, accident or intention, is in the driver’s seat. Ambiguity prevails in such a way that handwriting analysis cannot accurately interpret the personality traits behind the hand. Because these artists operate in this temperamental grey zone, the viewer is engaged with the softer, non-declarative realm of human touch and intimacy. The associations of Ruby Palmer’s visual imagery range from high modernism to whimsical fabrications made by children. Whenever feeling stuck or at an impasse with a painting or wall-relief structure, she moves to the floor. It is a liberation that allows her to shed the historical weight and conversation of easel painting and allows her to democratize space, and return to the fundamental impulse of playful improvisation. Palmer sees her light studies and constructions as deconstructed abstract paintings. Ambiguous images hover in a state of zero gravity due to the nuanced relationship between light, the surface it falls on, and the inter-mediating perforated structures. For Christopher Patch, whose pictorial imagery alternates between representation and abstraction, both the natural world and humankind’s relationship to it has continually served as his primary inspiration. With an innate aversion to being easily categorized, and a fluency in materials such as (but not limited to): printmaking, rope-weaving, watercolor, and collage, Patch fluidly alternates between various material opportunities in his multifaceted approach. The attraction to difficulty is an essential element in the studio practice of Benjamin Pritchard. His paintings emerge out of a search for meaning through a slow and repetitive process of addition and subtraction / definition and negation. The endoskeletons and exoskeletons of Pritchard’s quasi-geometric, organic structures coexist in a raw, restless, and ambiguous state. His recent paintings are private meditations on specific people, books, and spontaneous experiential moments in the world. The painted canvases of Michael Voss are small, intimate objects that are sensual in terms of surface and color, and distinctly urban in their sense of timing. The blur of the urban glance is a consequence of the compression of time, information, and movement. Through painting and drawing, Voss holds these moments of frenetic speed in disquieting stillness. His India ink tennis ball drawings seem to be a vehicle for him to explore the precariousness of unknowing. Due to the physical nature of the sphere, the omni-directional drawings can only be created by Voss and experienced by the viewer in a partial, fragmentary way, but allow for the viewing of countless, ever changing compositions. Parallel Art Space is an artist run exhibition space committed solely to exhibiting exceptional visual art. Positioned on the border of two of New York City’s most densely artist-inhabited and culturally rich neighborhoods (Bushwick, Brooklyn and Ridgewood, Queens) we endeavor to provide an exhibition platform based upon excellence, contribution and connectivity; serving the parallel interests of artists, community and culture alike.